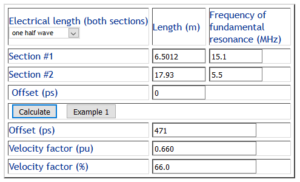 The method requires measurement of the lowest frequency impedance minimum of two different sections of the SAME cable with the SAME connectors (not just type, EXACTLY the same connectors), and from the measured lengths and frequencies, to calculate the velocity factor. Note that the method relies upon an assumption that velocity factor is independent of frequency. That assumption may introduce some small error for lossy lines at frequencies below about 10MHz, and is probably not suitable below 1MHz. I have two lengths of EXACTLY the same cable with EXACTLY the same type of connectors on them. I need to fit an adapter to my analyser to plug the cables onto it, and I have made a female S/C adapter from a panel socket with a strap soldered across the back of it. If we use the same adapters for both measurements, the effects will me nulled out… as will the connector anomalies. 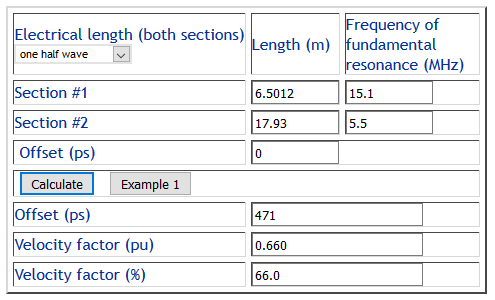 I measure the distance to the mm between the ends of the visible black sheath on both cables, and then measure the lowest frequency impedance minimum of each of them (… write the figures down as you measure them, don’t mix them up). I then enter them into the calculator Velocity factor solver. Above is the solution, the velocity factor is calculated to be 66.0%. Next Next post: Does common mode current flow inside coax?